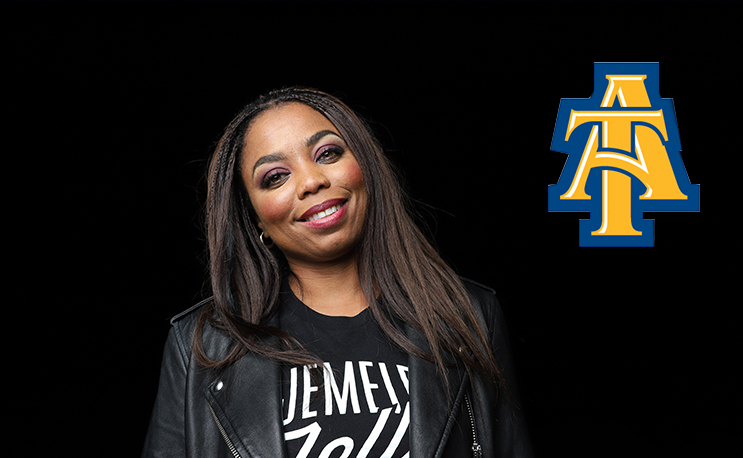 Jemele Hill is leaving The Four Letter Network, but will be talking with HBCU students in Greensboro. EAST GREENSBORO, N.C. (Aug. 28, 2018) – North Carolina Agricultural and Technical State University has tapped veteran journalist and soon-to-be-former ESPN correspondent, columnist and former co-host of the flagship “SportsCenter,” Jemele Hill to kick off the first Chancellor’s Speaker Series of the 2018-19 academic year, at 6 p.m., Tuesday, Sept. 18, at the Alumni-Foundation Event Center. Hill, along with moderator, alumnus and N.C. A&T football hall of famer Darryl Klugh ’00, ’03, will discuss, “Self-Expression and Sports,” touching on current topics surrounding sports in America, social media and life after sports. Born in Detroit, Michigan, Hill began her career covering Michigan State football and basketball. While there, she also covered the 2004 Summer Olympics and NBA Playoffs. In 2007, Hill received the inaugural Van McKenzie Cup award for boldly exemplifying the traits of the innovative sports editor for whom it is named. She credits McKenzie for her breakneck rise within sports journalism. Extremely familiar with the sports environment on and off the field, Klugh will add to the robust conversation through his own experiences. In addition to a successful academic career, earning a B.S. and M.S. in electrical engineering at A&T, he was an outstanding athlete. Voted an Associated Press NCAA Division I-AA All-American, Klugh led the 1999 football team to the MEAC championship and a first-round NCAA playoff win on the way to a then-record 11-win season. The Chancellor’s Speaker Series was created to bring nationally distinguished guests to N.C. A&T for campus dialogue on matters of current and abiding importance to the university community and the world beyond. It is part of the university’s commitment to creating an intellectual climate that encourages the creative exchange of ideas. This event is free and open to the public. Students must present their valid Aggie One card to receive a ticket. A limited amount of tickets will be made available to the public. All tickets will be available through the University Ticket Office located in Brown Hall beginning Sept. 5. For more information, contact University Relations at 336-256-0863 or visit Chancellor’s Town Hall Series online. To request media credentials, visit the university’s website.